I was recently at a show where a little boy was selling some really cool paracord show leads. I bought one (orange and black, naturally) and really like it. A friend bought a pink and black one, then commented that she’d like one much longer for obedience. I studied the construction a bit and came up with a rough idea of how to make the leash she wanted. Luckily, there is a website with the instructions on how to make the leash–a beautiful step-by-step that includes how to figure out how much cord you’ll need for your desired length of leash. There are a number of other good projects on that site as well. How to Make a Four Strand Round Braid Dog Leash From Paracord. 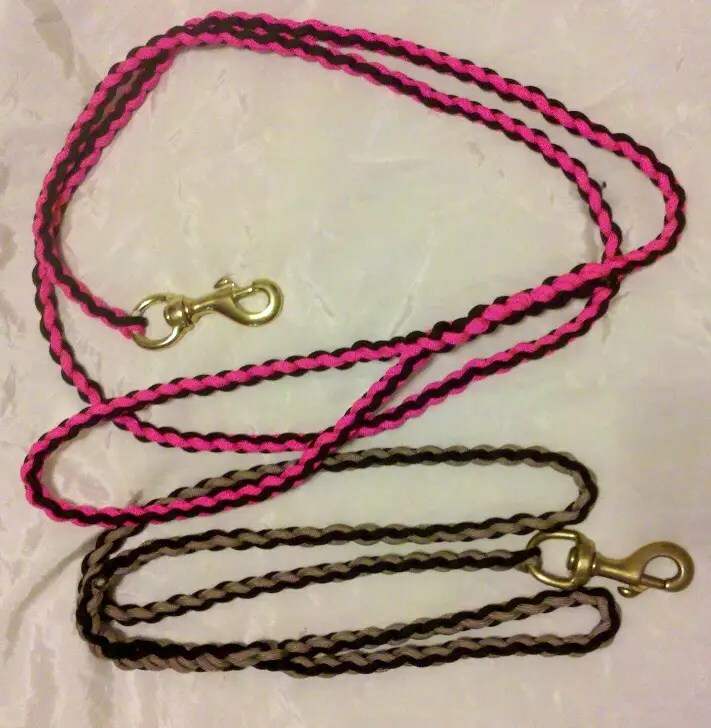 I used a brass snap on the tan/black leash and bronze on the pink/black. The nice thing with paracord is that it’s strong, light weight, and resistant to mildew. This is a great choice for leashes for your traildog. If you’re the kind of learner who really needs to see the motions of tying/weaving like I am, here is a great video that shows exactly what you need to do to make this kind of leash. Edit: I highly recommend using a clamp to hold down the snap end of the leash while weaving the rest of the leash. You’ll get a tighter, more uniform weave than if you simply hold the cord. I made a couple more leashes this way and I think they look much better. I also greatly prefer the wood burning tool to a lighter for sealing and securing the ends. Thanks for the linky love!! Your leash turned out great! !